A slight technical glitch prevented me from getting this up on Tuesday as planned. But it seems to be resolved now . . . so here is the post that should have gone up yesterday! All sorts of things come into the Library’s Archives, almost on a daily basis. Fashion catalogs, commercial patterns, odd bits of paper brick a brack, so that when a package comes, it’s always a surprise and a treasure hunt when I get to open it. There’s always swoon-worthy stuff . . . from that amazing chic 1950’s ensemble, to the complicated design of early century evening gowns. But – even amongst so much eye candy, there sometimes comes something exceptional that just grabs me. When I opened up this newly arrived issue, and saw this jacket, the first thing I did was scan the included pattern sheet to see if it was there . . . and found it! Not all of the garments shown in an issue are included in the pattern sheet, so it was just good luck that this jacket that I was so taken by was included. 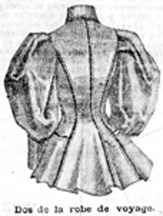 Looking at the illustration of the front and back, the jacket looks to be constructed using princess seams, which appear to be lapped (or welted) seams with top stitching. The shoulder seam is placed directly on the shoulder, and the collar is a standing, mannish style that folds over on itself. The sleeve is huge – it measures 32-1/2 inches across at it’s widest part. The leg 0′ mutton sleeve has the lower part fitted closely from the wrist to the elbow by a series of pleats. 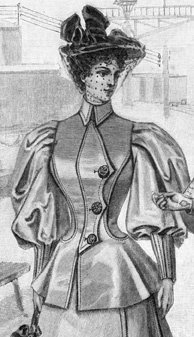 Many of these sleeves had a lining, and used netting or crinoline in between to keep the poofy shape of the sleeve. This pattern does not have a sleeve lining pattern included. The original text indicates that it is to be made of a gray-blue serge and trimmed with large metal buttons. 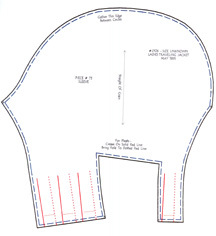 Given how small the sizing is on this pattern, my usual method of sewing a muslin and then slashing and adding is probably not going to give as good results as starting with a pattern that is closer to my dress form’s size. I have a set of princess pattern blocks from String Codes, which I’ve had for quite a while, and haven’t put to use. I’ve heard mixed reviews about how accurate they are for pattern design – I’d love to hear from anyone who’s used their product. 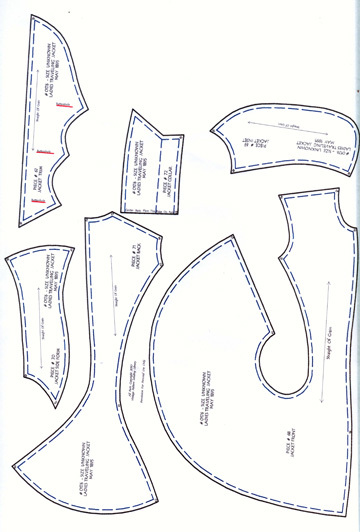 I think in this case, even if they don’t turn out to be very accurate – they will provide a jumping off place to start working with the original pattern pieces. That amazing sewing maven at the Sew Weekly blog has done it again! Her version of our pattern # T3946 is sure to turn heads at the upcoming Bay Area Gatsby Weekend. Be sure to scroll down in the blog and read all the details about the construction of this dress!. 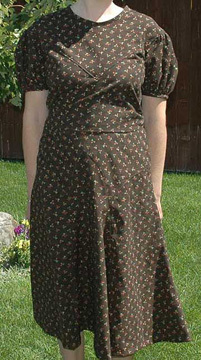 This version of our pattern # T1060 has the elegant styling that all of the classic 1930’s dresses show. 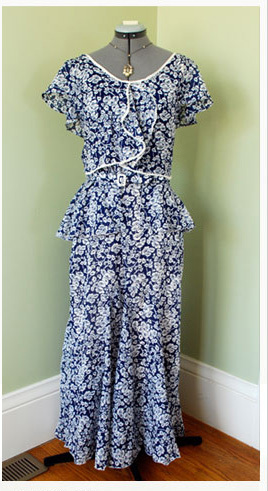 Featured at the FABRICATIONS Blog – there is a wonderful detailed write up on the construction of this dress.